Ria Loves Pawlish: China Glaze The Great Outdoors... Wood You Wanna? we got AMAZING news today!! Mr. Pawlish is getting promoted to Lieutenant Commander! i'm so very proud of him :) we've been praying really hard that he would get it, because if he hadn't our lives would have changed dramatically. we're so very thankful to God!! today we have Wood You Wanna? 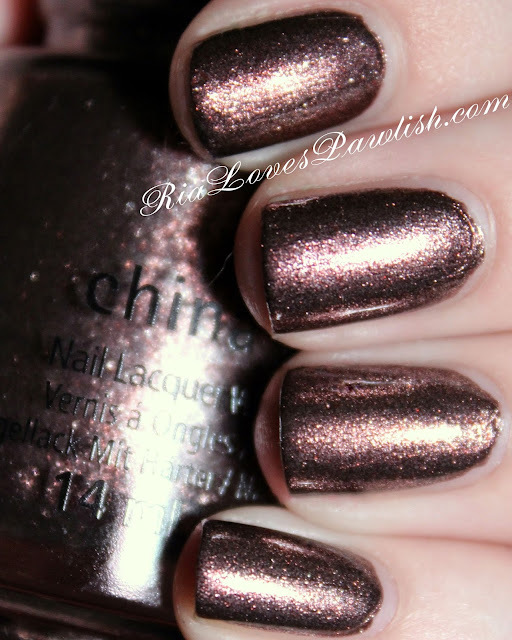 from China Glaze's The Great Outdoors collection to check out! (it's a press sample, kindly provided to me for review). it's a bronze foil that i think would be flattering on all skin tones! the formula is so easy to work with, you could do one coat... but as usual, i prefer two. there was very little streaking, just make sure to keep your strokes even and you'll be good to go. i definitely recommend using topcoat to bring out the sparklies! two coats Wood You Wanna?, topped off with one coat Salon Perfect Crystal Clear Top Coat. (both are press samples). Labels: Bronze, China Glaze, Chrome, Foil, Nail Enamel, Nail Lacquer, nail polish, nail varnish, Press Sample, Salon Perfect, The Great Outdoors, Wood You Wanna? Such a gorgeous color! And congrats to your hubby!